Analyzing the area object of the competition in the historical maps, we can determine how the profound urban changes have completely transformed the center and therefore the structure of the whole city. Researching the primigenial functions that have generated the spaces and the infrastructures we can understand their stratification and the various hierarchies of the axes that over time have changed their strength, moving the poles of an evolving city. This short historical journey will guide us to understand the genesis of the most critical hub of the center, the intersection of Via Roma and the Sentierone. This is a problem more of an urbanistic nature, but the problems of Piazza Dante and Cavour are different, more formal and functional. Already in the first views by Alvise Cima XVI - XVII (fig 1) we can identify the current field. Between the village of San Leonardo and the Borgo di S. Antonio there is a large green belt (Sant'Alessandro meadow) that from the low city walls reaches Pepitale S. Antonio. On the edge of this great "void" there are two buildings that are still part of the city and which, with their persistence, have shaped the scope of the area. These are: S. Marta () (access to his court takes place under the Piacenza portico of the popular bank of Bergamo) and S. Bartolomeo (). The connection between the two villages is clear, precisely from Piazzetta S. Spirito to today's Piazza Pontida. A path in the middle of the fields that we have traveled for centuries. Here the Sentierone still maintains its hierarchy because the way more than to cross it is attested. Subsequently the Via Ferdinandea will be called Via Roma in the stretch between the walls and the fair, while from the fair to Porta Sant'agostino Via Vittorio Emanuele II. In the 1901 map (Figure 4) Via Roma becomes the generator of Via Papa Giovanni XIII reaching the train station. At this point the Sentierone, which by its genesis was united, is cut transversely by this important axis, thus creating two strong directions: - the north-west, south-east axis (Via Roma, Via Papa Giovanni XIII) - the north-east, south-west axis (Sentierone) This in the twentieth century becomes one of the most important and relatively busy intersections, first by ancient trams and carriages, then by cars and public transport. In 1907 Quaroni and Piacentini maintained their well-established axes, redefining the Sentierone, clarifying the visual perspectives that today characterize the center of Bergamo as we know it. Today we find a hub that conveys a great quantity of vehicles in the city center to reach the parking lots of Piazza Matteotti, those covered with Via Borfuro, the residential ones and those for loading and unloading goods. With the progressive pedestrianization of the areas of the center we will have a large vehicular artery (Via Roma) that will no longer have relations to its cross-pedestrian cycle (Sentierone) (Fig. 5). The intersection of Via Roma and the Sentierone therefore presents the following weaknesses: - It is a physical and material limit The road presents an asphalt pavement in discontinuity with the material of the Sentierone and Piazza Vittorio Veneto. - It is a cutting element of the cycle-pedestrian flow of the path The pedestrian and the cyclist are forced to interrupt the flow perpendicular to the road. These flows inevitably converge towards the road crossings that act as attractors, forcing the user's path to follow precise trajectories to reach the crossing point. All the space excluded from the trajectories is no longer a useful space for the user. - It is a discontinuity of the visual of the path The longitudinal visual axis to the Sentierone and to the tree-lined avenue is cut transversely by the flow of the vehicles of Via Roma and during their stop or slow down a clear visual barrier is created between us and the points of interest. - It is an invasive element for the view of the center and of Città Alta In addition to vehicles, the road carries with it a series of other invasive elements that contrast with a panoramic vision. We became accustomed to their sight, but the vertical signs with its traffic lights, light poles, signs and various poles, are foreign bodies in the landscape, are those elements that avoids framing by photographing Città Alta. (fig 6) - It is an element of danger for pedestrians The Sentierone and Via Roma have two different speeds but live at the same altitude, the crossings are particularly dangerous especially during events and events. The traffic lights that regulate pedestrian crossings cause slowdowns and traffic that lead to more pollution, both environmental and acoustic. 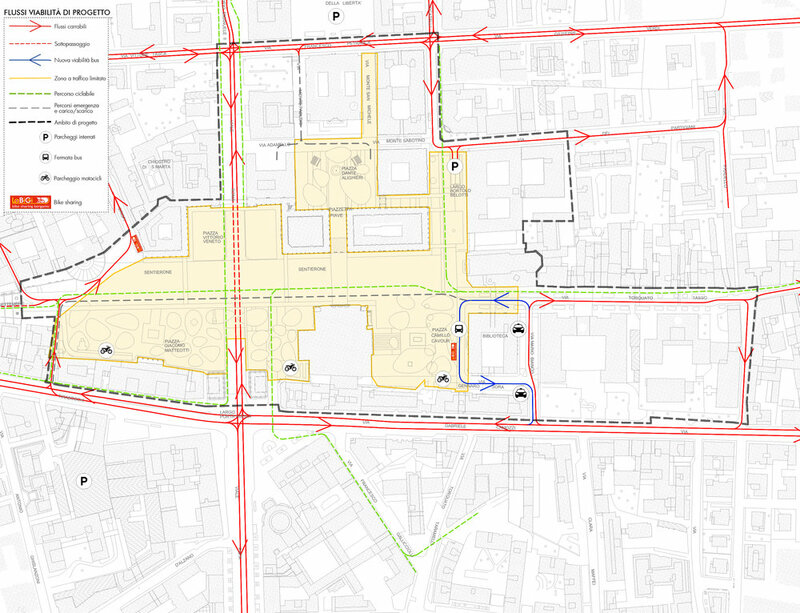 During events and demonstrations taking place on the Sentierone and / or in Piazza Vittorio Veneto, there is the need to close Via Roma to the traffic, this becomes a source of distress for the residents, making more access roads to the Upper Town. While, in case the road is not closed to traffic, the pedestrian crossings are regularized by the local police. Thus we find ourselves having the heart of our divided city, the Sentierone, the Vittorio Veneto square, the gardens, all the respective functions and relationships, interrupted. The two parts of the path are called and attracted as magnets since history divided them. In this contest we give a perspective to their reunion, we suture an open wound, an operation that will be reflected in all the other project areas and beyond. It unifies them in a single element, in a single large square in the deepest sense of the term, the place of community relations. 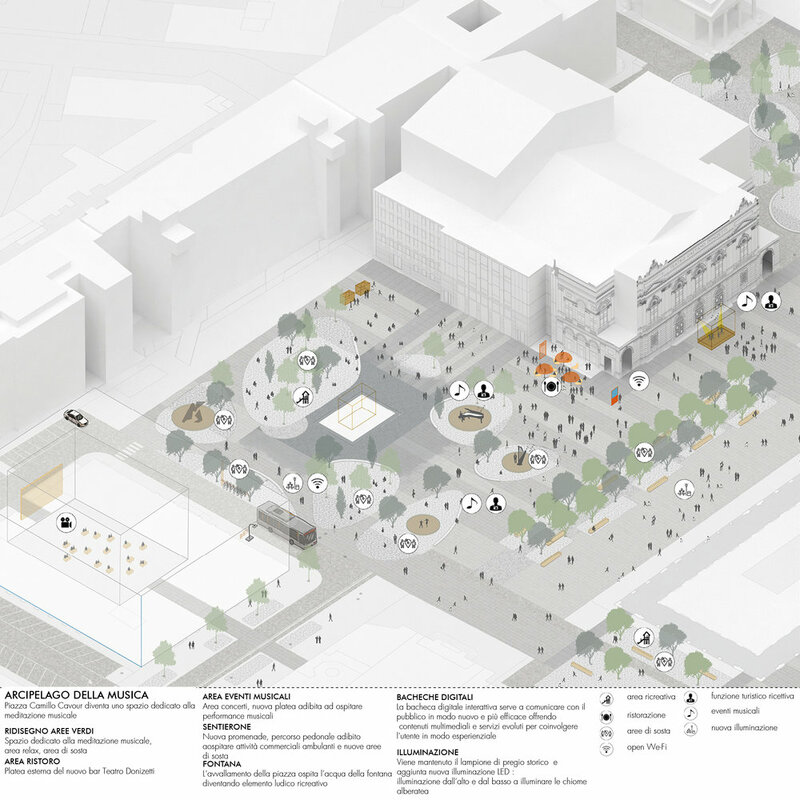 The project proposal that we present as a premise deals with the removal of Via Roma for the section of the Sentierone and Piazza Vittorio Veneto. Thus the physical and material limit is eliminated because the floors of the two parts are in solidarity. The cycle-pedestrian flow continues its trend according to the points of interest and no longer to reach the pedestrian crossings and the system becomes a continuum (fig.7) without more obstacles of road signs and private vehicles favoring the visual cone of the whole Sentierone and Via Tasso. But the favored perspective is that towards Città Alta, in fact without the disturbance of the vehicles you can enjoy the best point of view, perfect tourist attraction. The pedestrian area and the doubling of the level of flows (the pedestrian above and the vehicular below) (fig 8) guarantees the total safety of the pedestrian and of all the events and events unfolding, without needing to close Via Roma at the traffic. Moreover, by burying Via Roma, the pedestrian traffic lights are eliminated, facilitating and speeding up even the driveway flow.